Nuapada: JamiI Jungle Mukti Andolan(JJMA), Nuapada affiliated to Campaign for Survival and Dignity(CSD), Odisha organized a huge protest Rally on 8th August 2017 at Nuapada. 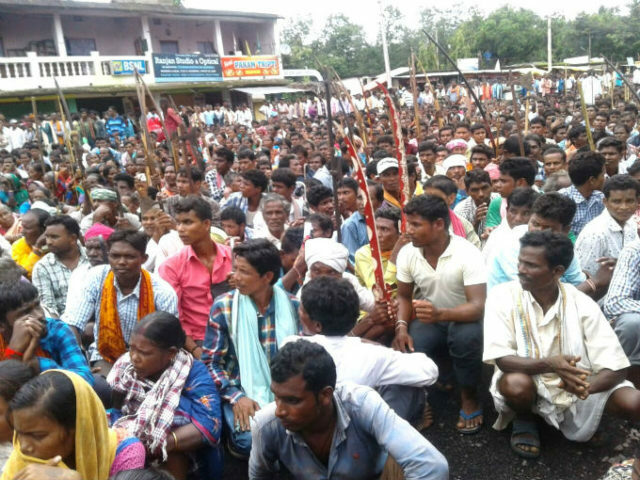 Around seven thousand Tribals and forest dwellers from all the 5 blocks( Nuapada, Boden, Komana, Sinapali and Khariar gathered at Mini Stadium in the morning and hold rally in the town and gheraoed the collector office and blocked NH 353 for around 3 hours. The protesters gave slogan against the district administration and tried to enter inside the collector office demanding collector’s assurance in public to address their demands but after assurance of Trilochan Minz, additional Collector and Sarat Chandra Srichandan, the Sub collector , the huge gathering brought into control. Judhistir Sahu leader of Boden block gave slogan against the forest department for launching illegal and anti-FRA “Ama Jungle Yojana” and promoting Vana Surakshya Samiti in the district subverting community forest right. Manohar Chauhan, member CSD, Odisha who have done detailed study of FRA implementation in Nuapada district said “the major problem in recognition of IFR and CFR rights have been the consideration of “gramya jungle jogya” kissam of land by district administration as non- forest land. He further said “while the “gramya jungle jogya kissam of forest land is being treated as forest land by the forest department and IFR title have been issued earlier in the district over such land, most of the IFR claims have been rejected arbitrarily mentioning “gramya jungle jogya” kissam of land as non- forest land in the district. Besides, non-recognition IFR to OTFDs, and non-recognition of CFR rights have been the major issues in the district.” He also claims that whatever CFR rights(18) said to have been issued in the district are in fact issued as per Section 3(2) of FRA and not as per 3(1). 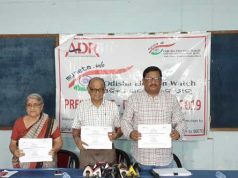 It is to be noted that with the CSD, JJMA was the part of the larger struggle for the enactment of Forest Right Act, 2006 by the parliament in 2006 and from last 12 years the sangathan consistently fighting for the recognition of forest rights in the district. As per the FRA SLMC, Govt. of Odisha by June 2017, in total 23,257 Individual Forest Rights claims including 9761 of Other Traditional Forest Dwellers(OTFDs) have been submitted at the Gram Sabha level. istrict. Gram Sabhas have approved 12042 IFR claims including 3471 of the OTFDs but SDLC approved only 6982 IFR claims of STs and rejecting all claims of OTFDs duly approved by gram sabhas. In total 12,215 IFR claims(6133 of STs and 6082 of OTFDs) have been rejected in the district. By 30th March 2017, only 6456 IFR titles have been issued over 7083 Hectares (17495.01 acres) of forest land. It is also reported that while 609 CFR claims have been filed at the Gram Sabha level by June 2017, only 20 CFR claims have been approved have been approved by Gram Sabha and 18 CR titles have been issued in the district. Nuapada district is small district having 5 blocks and forest land constitutes about 50% (mostly revenue forest land) of the total geographical area. 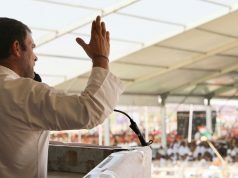 Among others who addressed the huge gathering are Saudagar Sahu, Duryodhan Sahu, Judhistir Sahu, Hanuram Majhi, Chaitanya Majhi, Pingal Majhi, Alok Guru, Akshya Nanda, Rabi Mongraj, Tirthaa Majhi, Sambhu Chandrakar Chaitram Nayak Hem Das etc. Besides, Congress district president, Ghasiram Majhi and Ahiraj Panigrahi joined as guest speaker on the occasion. At the end of the programme, a memorandum having 11 points of demand including recognition of community forest right to the all gram sabhas, recognition of IFR rights of OTFDs and rest ST claimants, ST status to Paharia tribal, declaring Nuapdada district as drought area, covering all the IFR land under agricultural insurance etc. At the end of the programe memorandum was submitted to the district Collector Dr. Poma Dudu, the Chairman, FRA District Level Committee, Nuapada.